Build 2017: Windows 10 Fall Creators Update announced with Timeline, Windows Story Mix and Microsoft Fluent Design System features. Today, at Build 2017, Microsoft announced the next wave of Windows 10 innovations built to empower the creator in all of us - the Windows 10 Fall Creators Update. 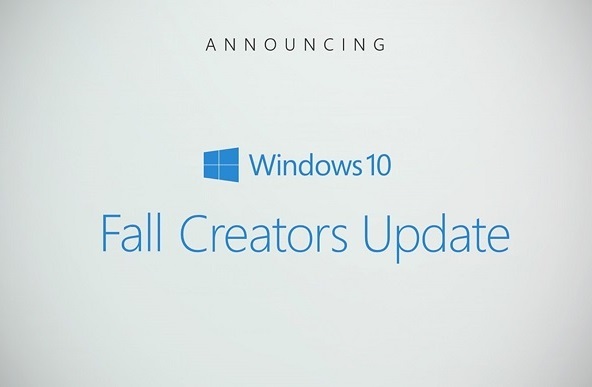 Available later this year, the Fall Creators Update delivers new experiences for more than 500 million Windows 10 devices: A new design system for the next wave of creativity across devices; experiences that move with you across Windows, iOS, and Android; iTunes, Spotify, SAP Digital Boardroom are coming to the Windows Store. Built on .NET and distributed through the Windows Store as a Universal Windows Application, Story Remix uses AI and deep learning to organize and transform your photos and videos into stories. It will use the Microsoft Graph to connect you and your friends across devices. Story Remix brings your memories, or even your friends' photos and videos together to create stories with a soundtrack, theme, and cinematic transitions. You can also create mixed reality by adding 3D objects to your photos and videos to tell stories in a whole new way or turn your photos and videos into your canvas, drawing on them with Windows Ink. Fluent Design will deliver intuitive, harmonious, responsive and inclusive cross-device experiences and interactions. For developers, Fluent Design is built to help you create more expressive and engaging apps that work across a wide range of device and input diversity. The Microsoft Graph is an intelligent fabric that helps connect dots between people, conversations, projects, and content within the Microsoft Cloud - ensuring experiences flow seamlessly between Windows, iOS, and Android devices. Getting things done across all the devices you use should be easy. That's the principle behind several of the new features that will begin to roll out with the Fall Creators Update - leveraging both the new Fluent Design System and the intelligence of the Microsoft Graph. 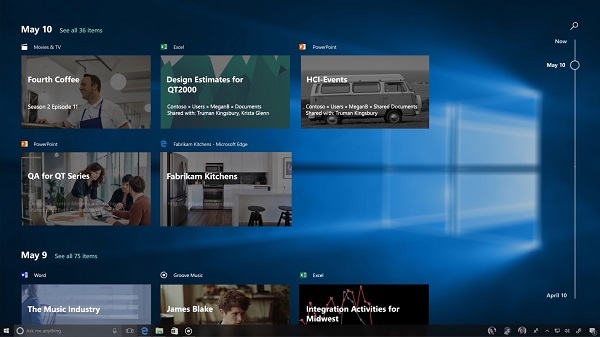 Timeline: With Timeline in Windows 10, you can now jump back in time to find what you were working on. With a visual timeline that displays what you were doing when, you can easily hop back into files, apps, and sites as if you never left. Pick Up Where You Left Off: With Cortana, you can pick up where you left off across Windows, iOS, and Android devices. Imagine logging off your PC and having the doc you were editing pop up on your phone. Cortana asks if you want to pick up where you left in your app, doc, or website. It's like having your PC and your phone finish each other's sentences. Clipboard: Clipboard is a fast and easy way to copy and paste just about anything between connected devices, whether you're on a Windows PC or your favorite mobile phone. Just hit copy on what you want to grab - your photo, map link, paragraph, or even an animated gif- and it is ready to paste into whatever you want. It's the Clipboard you know and love, now cloud-powered. OneDrive Files On-Demand: Access all your files in the cloud without having to download them and use storage space on your device. You don't have to change the way you work because all your files - even online files - can be seen in File Explorer and accessed on-demand whenever they are needed.